Thursday ! ATL Workers Raise Up Against Wage Theft! Enough is Enough! Atlanta Workers Raise Up Against Wage Theft! Join local fast food workers & community leaders for a rally to stop wage theft. ATL Raise Up + Atlanta Jobs with Justice are hosting our 2nd Atlanta Wage Theft Action highlighting the widespread issue of workers having wages stolen by their employers in the fast food industry. Join us for a creative street demonstration highlighting the issue of wage theft and stand with local fast-food workers as they share their stories and fight to win back their stolen wages. We will not stand by while fast food companies are robbing their employees of their already low-wages by forcing them to work off the clock, shaving hours off their time cards and not paying them overtime, among other practices. We demand that fast food companies like McDonald’s, which earned nearly $5.6 billion in profits in 2013, pay back the stolen wages and stop its illegal theft of workers’ pay. Please join us this Thursday at 6pm, workers need your support! Join us for a Rally + Press Conference to stand with local McDonald’s workers and fast-food workers from other companies as they share their stories of wage theft. 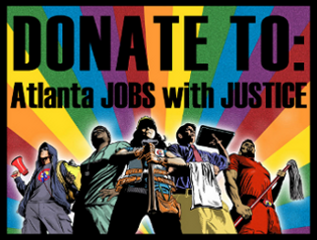 ATL Raise Up + Atlanta Jobs with Justice are hosting the first Wage Theft Wednesday highlighting the widespread issue of workers having their wages stolen in the fast food industry. We are joining a nationwide series of actions calling on the McDonalds to stop its illegal wage theft. McDonalds is being sued in three states over widespread wage theft and we're finding that these issues exist here in Atlanta as well. We will not stand by while McDonald’s is robbing their employees of their already low-wages by forcing them to work off the clock, shaving hours off their time cards and not paying them overtime, among other practices. We demand that McDonald’s, which earned nearly $5.6 billion in profits in 2013, pay back the stolen wages and stop its illegal theft of workers’ pay. Don't get Hamburgled by McDonalds! For every year that Gov. Deal prevents the expansion of Medicaid, we know that 3,600 of our loved ones, family members, friends, coworkers, neighbors, and other Georgia citizens are at risk of dying from a lack of access to healthcare. Send a strong message to Gov Deal and his allies in the Legislature that we will not accept HB 990 or any other barriers to access of health care, instead he needs to EXPAND MEDICAID NOW! Please call Chairwoman of the Health and Human Services Committee, Senator Renee Unterman - 404-463-1368, to express your opposition to HB 990.